NPR Fact-Checks Republican Defense Of GOP Health Bill : Shots - Health News In TV appearances and meetings with constituents, House Republicans are highlighting parts of the law that protect consumers, while glossing over loopholes that allow insurers to avoid paying. 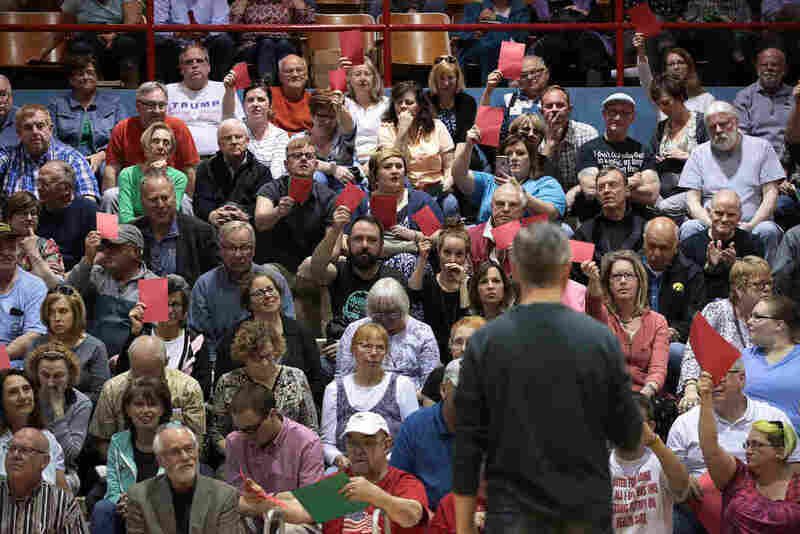 People attending Rep. Rod Blum's town hall event in Dubuque, Iowa, this week held up red sheets of paper to show disagreement with what the Republican congressman was saying and green to show they concurred. The GOP health care bill was a major concern of many. Reed was responding to a constituent who was concerned about a child with severe allergies: "His co-pays and deductibles will be through the roof," the parent told Reed, "because he's going to be in a high-risk pool — because he has a pre-existing condition." "No, no, no," Reed told the parent. However, the GOP bill also has an enormous loophole in that regard. The plan allows states to apply for waivers from the federal government that get them out of many of the regulations put in place under the Affordable Care Act — including one that bans insurance companies from charging people with pre-existing conditions more for a health plan. A waiver would allow insurance companies to consider a person's health status when determining what to charge for coverage. And that means that although someone with a pre-existing condition who lives in a state that got a waiver would have to be offered a policy, it could be very expensive. "No matter what kind of plan you have today," Scalise told Fox News, "if you have a pre-existing condition, under our bill, you cannot be denied coverage and you cannot be charged more than anybody else." Before the Affordable Care Act, insurance companies denied coverage or charged more if the person who wanted insurance had any of a long list of conditions — including arthritis, diabetes, heart disease, muscular dystrophy, obesity and sleep apnea, according to a list compiled by the Kaiser Family Foundation from insurers' underwriting guidelines. If you have cancer and buy insurance that doesn't pay for your cancer treatment, your pre-existing condition is effectively excluded. "If you're getting your insurance through the group health care marketplace — your employer — nothing changes," Blum told constituents this week. "If you're getting your health insurance through Medicare, nothing's going to change. If you're currently getting your health insurance through Medicaid, nothing's going to change." Blum's statement refers to a couple of big things — employer coverage and Medicaid. In "waiver states," employers' insurance policies might no longer be subject to Obamacare regulations around so-called essential health benefits — the minimal benefits that must be included in a policy. Blum's second statement — the one in regard to Medicaid — is false. The GOP health bill makes major changes to Medicaid, first by rolling back the expansion of the program over time. The bill allows people to keep their expanded Medicaid as long as they remain eligible. But people at or near the poverty level often see their incomes fluctuate, making them temporarily ineligible for the health care program. Under the GOP bill, once they leave the Medicaid rolls, they likely would not be able to return, even if their income declines. That's because the federal government would pay a lower share of their costs and most analysts --including those at the Congressional Budget Office -- believe that most states are unlikely to continue the expanded coverage at the higher cost. Many services provided by Medicaid today, including home health care and services for people with disabilities, are considered "optional" under the GOP health bill. Those are also the services that help keep people out of hospitals and nursing homes. An earlier version of this story said that under the GOP bill, once people leave the Medicaid rolls they would not be able to return, even if their income declines. In actuality, the bill does not bar their return, but they would probably lose that option because states would receive less funding for Medicaid when people leave the rolls.